Explanation: In the shadow of Saturn, unexpected wonders appear. The robotic Cassini spacecraft now orbiting Saturn recently drifted in giant planet's shadow for about 12 hours and looked back toward the eclipsed Sun. Cassini saw a view unlike any other. First, the night side of Saturn is seen to be partly lit by light reflected from its own majestic ring system. 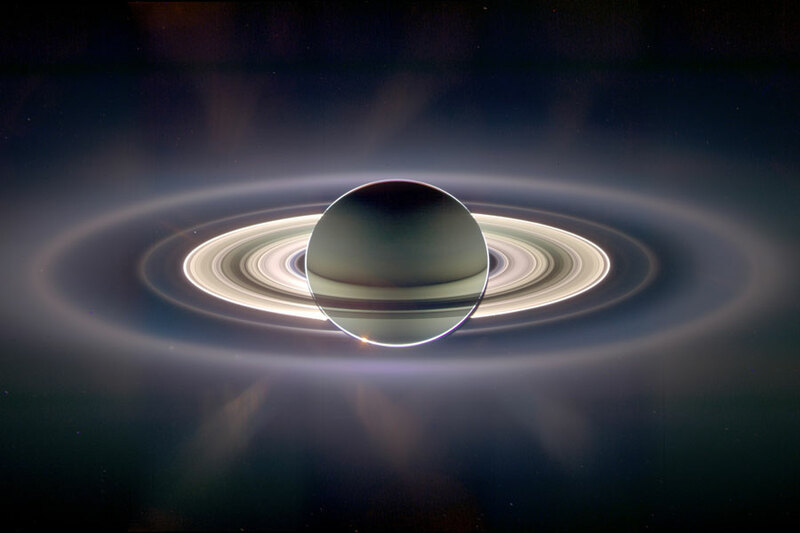 Next, the rings themselves appear dark when silhouetted against Saturn, but quite bright when viewed away from Saturn, slightly scattering sunlight, in this exaggerated colour image. Saturn's rings light up so much that new rings were discovered, although they are hard to see in the image. Seen in spectacular detail, however, is Saturn's E ring, the ring created by the newly discovered ice-fountains of the moon Enceladus and the outermost ring visible above. Far in the distance, at the left, just above the bright main rings, is the almost ignorable pale blue dot of Earth.